Jennifer Aniston and Justin Theroux enjoy a weekend date night with their mums. 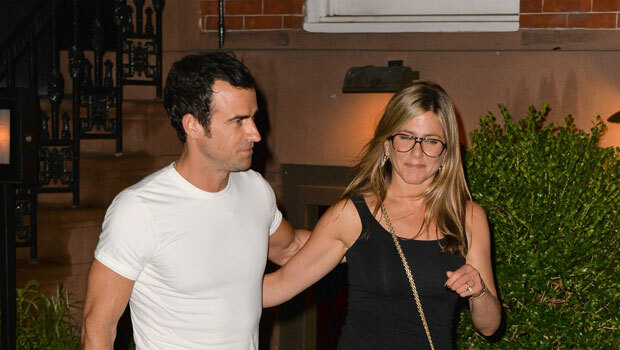 Jennifer Aniston was seen leaving Manhattan’s Blue Hill restaurant this weekend after dining out with Justin Theroux and their respective mothers. With rumours that plans for the forthcoming wedding are on hold, the pair’s relaxed family meal in the city – almost exactly one year on from the engagement – suggests that plans are still in their early stages. As the couple continue to lead separate working weeks – Jennifer on the New York set of Squirrels To The Nuts and Justin filming TV show The Leftovers – they are choosing to enjoy relaxed weekend dates for quality time together. Jen has joked that the couple are enjoying a ‘5:2 relationship diet’, eating well during the week and using relaxed rules on weekends. Amid the dieting humour, some Hollywood reports have speculated today that Jennifer could be pregnant, suggesting that she looked ‘bloated’ after her weekend with Justin and questioning her choice of loose-fitting clothing – it might also explain the necessity to luncheon with both mums. Though Jen is never far from pregnancy rumours (and the world has gone a little baby-crazy of late), we think it’s pretty fair to say she just opted for the pasta dish at lunch. Isn’t she going to make a beautiful bride?